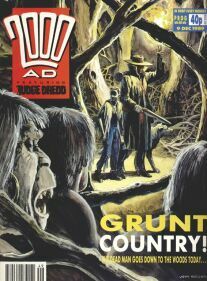 I was just reading the latest entry in alexf's excellent Heroes of 2000 AD blog where he highlights the excellent work of Chris Lowder, aka Jack Adrian. "By 1978, he was near the top of Tharg's 'on-call' list - he's one of the few droids credited with three strips in a single Prog! Prog 78, fact fans. Off the top of my head, there are four others who've achieved this feat..."
I know Dan Abnett had three strips the other week, but who might make up the remainder of this elite group? Wagner, Mills and Grant must be obvious guesses but I couldn't pin down the actual progs. 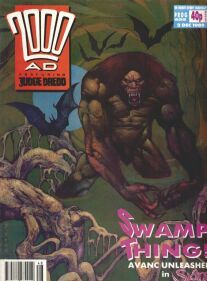 I guess some of the very early progs must be a good bet for Pat Mills as he was writing a lot of the material. Anyone able to give an authoritative answer, in whole or part? Cool! Three down - one to go..? Hang on... which thread is that? Yeah, that's the one. There's another three-in-a-prog gent mentioned there too. 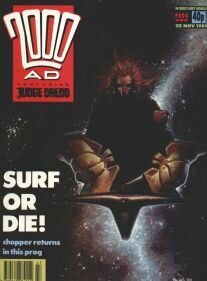 Si Spurrier (prog 1482), for non-other thread visiting completists. Barney gives Pat Mills a writing credit for all five strips in prog 1.